"KY-5" redirects here. For the state route, see Kentucky Route 5. Kentucky's 5th congressional district is a congressional district in the U.S. state of Kentucky. Located in the heart of Appalachia in Southeastern Kentucky, the rural district is the second most impoverished district in the nation and, as of the 2010 U.S. Census, it has the highest percentage of White Americans in the nation. Located within the district are the economic leading cities of Pikeville, Prestonsburg, Middlesborough, Hazard, Jackson, Morehead, Ashland, London, and Somerset. Kentucky's 5th congressional district - since January 3, 2013. The current 5th congressional district is one of the few ancestrally Republican regions south of the Ohio River. Much of the region now in the district strongly supported the Union in the Civil War, and identified with the Republicans after hostilities ceased. Much of the eastern portion of the district was once part of the disbanded 7th congressional district, long a Democratic stronghold. The 7th district was disbanded in 1992 after the 1990 census showed that the state's population could no longer support seven districts. Geographically, the district consists of flat land areas to the west, to Appalachia highland mountains to the east and southeast. To the north to northeast of the district are rolling hills that end at the Ohio River. The district is currently represented by Republican Harold D. "Hal" Rogers, the dean of the Kentucky delegation. Congressman Rogers currently serves in various top leadership positions in the U.S. House of Representatives. As of September 2013, there were 510,329 registered voters: 253,798 (49.73%) Democrats, 235,470 (46.14%) Republicans, and 21,061 (4.13%) "Others". All of the "Others" included 15,344 (3.01%) unclassified Others, 5,385 (1.06%) Independents, 241 (0.05%) Libertarians, 43 (0.0084%) Greens, 21 (0.0041%) Constitutionalists, 20 (0.0039%) Reforms, and 7 (0.0014%) Socialist Workers. 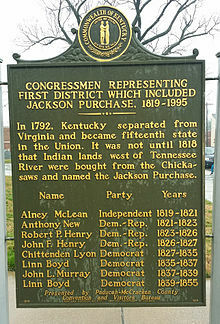 March 3, 1807 Redistricted from the 2nd district and re-elected in 1803. April 10, 1810 Elected in 1806. Resigned to become governor of Louisiana Territory. March 3, 1811 Elected to finish Howard's term. March 3, 1825 Redistricted from the 3rd district and re-elected in 1822. August 6, 1834 House declared new election after election was contested Garrard County added to the district. January 3, 1943 Redistricted from the at-large district and re-elected in 1934. January 3, 1965 Redistricted from the 8th district and re-elected in 1962. ^ "Registration Statistics: By Congression District". Kentucky State Board of Elections. September 2013. Retrieved 2014-02-06. ^ "Registration Statistics: Other Political Organizations and Groups". Kentucky State Board of Elections. September 2013. Retrieved 2014-02-06. ^ "Kentucky Administrative Regulations 31KAR4:150". Kentucky Legislative Research Commission. November 2005. Retrieved 2014-02-06. ^ "Register To Vote". Kentucky State Board of Elections. August 2003. Retrieved 2014-02-06.